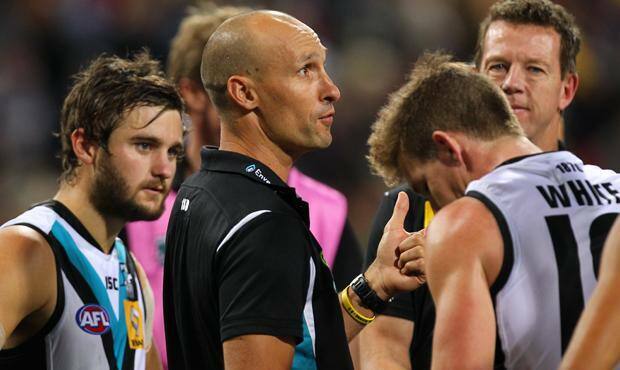 PORT Adelaide's post-season review has resulted in the club sacking forwardline coach Tyson Edwards. Edwards joined the Power as a development coach ahead of the 2012 season and was in charge of the forwards in 2014 and 2015. Port's decision not to renew Edwards' contract for next year follows the departure of assistant midfield coach Josh Carr late last week, who was appointed senior coach of SANFL club North Adelaide. Power coach Ken Hinkley said Edwards had the skillset to coach at another club. "Tyson Edwards is a terrific football person who has dedicated himself to helping the players and club during his time here," Hinkley said. "This is a tough time of year, where difficult decisions are made and unfortunately for Tyson he has come out of contract. "Tyson will make a great coach when his next opportunity presents itself and we would like to thank him for his service to Port Adelaide. "We wish Tyson and his family all the best in the future."